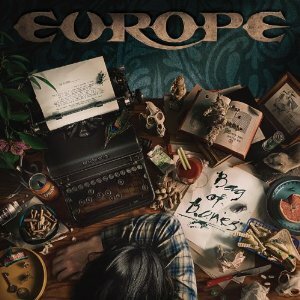 Legendary Swedish rock band Europe are releasing their latest album, "Bag of Bones" at the end of April. The album was recorded with producer Kevin Shirley who has produced albums for Iron Maiden, Joe Bonamassa, Black Country Communion, Black Stone Cherry and Journey - a pretty impressive CV. The first time I put this album on I actually thought at first that I'd put the wrong CD on - this album is heavier with more of a classic rock feel than anything the band have done before, and it just blew me away. The bands last album, "Last look at eden" was great, but this is just superb. It's definitely my favourite Europe album ever, and Joey Tempest agrees - saying it's probably his favourite Europe album yet. The first single to be released from the album is "Not supposed to sing the blues", a great song and one which gives a great introduction to the album - it's got a good heavy guitar sound and Joey Tempest's vocals are great and full of passion. A great blues-tinged rock track. The lyrics for title track, "Bag of Bones" were inspired by last years riots in London, where singer Joey Tempest lives, and includes lines like "my city lies in ruins". The track also features some slide guitar work courtesy of Joe Bonamassa. During "Firebox" there is a section where the keyboards are used to give a very Indian (possibly Sitar) sound, which gives this song an eastern mystical feel. "Doghouse" was the first song fans got to hear from the new album - it was played on their tour early last year and was included on the live DVD - "Live at Shepherds Bush" that was released last year (and which is a great live show). This album will surprise a lot of people. Europe fans will love it and anyone who thinks Europe still sound like "The final countdown" should definitely do themselves a favour and give this new album a listen - it's good heavy classic rock and is a fantastic album. I really can see this album winning them a lot of new fans. Europe will be playing the Download festival at Castle Donington this summer and touring Europe in the later part of the year with UK dates in November - they were great on their last tour, and with the quality of this new material, I for one can't wait to see them play live again. The UK tour dates are..
"Bag of Bones" will be released on 30th April via earMusic.